With a season-high 5,982 fans in attendance for the Blue-Green rivalry game, the Thunderdome was rocking Saturday in anticipation of the start of Big West play for the UCSB men’s basketball team. Unfortunately, fans left disappointed as the Gauchos fell 72-64, unable to finish a late-game rally from a double-digit deficit. Despite a monstrous performance from junior center Alan Williams, the Gauchos fell short in their conference opener, dropping the team to 9-5 on the season and 0-1 in the Big West. Cal Poly, who was victorious in the Thunderdome for the first time since 2007, improves to 6-9 overall and 2-0 in conference. Santa Barbara opened the rivalry game flat, trailing 28-24 at the half, and did not respond much better in the second half, falling behind by 12 in the early minutes after the break. The Gauchos rallied to as close as three but could never get over the hump, often failing to hit clutch shots and opting for three-pointers instead of the steady inside presence of Williams. UCSB shot 2-17 from the three-point line, whereas Cal Poly finished 11-18 from behind the arc, proving to be the major difference in the game. The only story for UCSB in this game was Big Al’s 33-point, 15-rebound performance. Williams scored 22 for UCSB in the second half and was one of only two Gauchos to score in double figures, the other being junior point guard Zalmico Harmon with 10 points. The Mustangs received much of their scoring from unlikely sources in this game. Junior forward Anthony Silvestri finished with a team-high 17 points, going 5-7 from behind the arc despite his season average of under four points scored per game. Another bench player in freshman guard Taylor Sutlive added 11 points on 3-4 shooting from the three. Together, the duo provided dagger after dagger towards Santa Barbara’s hopes of climbing back in the game. Opening conference play with a loss, especially at the hands of a rival, was a major disappointment for the Gauchos considering how well they played in the non-conference portion of the schedule. UCSB next hosts Long Beach State on Thursday. 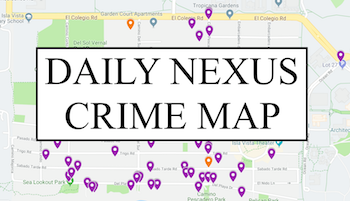 A version of this article appeared on page 5 of January 13th’s print edition of the Daily Nexus. 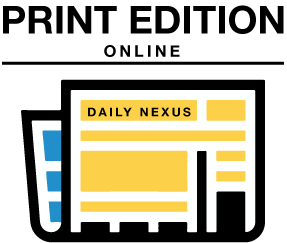 Photo by Anna Kodelashvili of the Daily Nexus.